Ideal Tax Solution, LLC continues to bolster its service protocols in anticipation of a continued rise in the need for professional tax resolution services. The demand for experienced tax liability specialists shows no signs of abating. Providing the absolute best results in the tax debt resolution process requires a daily commitment to excellence and customer satisfaction. Ideal Tax Solution, LLC finds itself in constant motion as individuals and businesses search out established and experienced tax debt resolution companies in an effort to move forward in what is promising to be a busy and rejuvenated economic climate. Troubled taxpayers are struggling to shake off the after effects of a tough financial period which found large numbers of them languishing in delinquent taxpayer status. They are now actively working to rebuild their lives and tax relief specialists are playing an ever increasing role in returning them to taxpayer in good standing status. Ideal Tax Solution has worked extensively with individuals and businesses interested in resolving tax debt liability in expectation of a renewed fiscal climate with enhanced opportunities for increased financial growth and stabilization. Resolving outstanding tax debt lays the groundwork for creating a financial strategy that can free people from the grasp of the IRS collection process and return them to the stress free lives they were living before the need for professional tax debt help interrupted their daily routine. 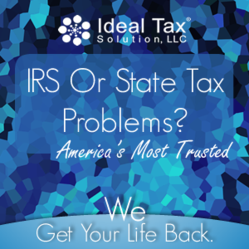 Experienced tax liability relief companies like Ideal Tax Solution have witnessed firsthand the growing number of troubled taxpayers who are interested in working with tax resolution specialists to resolve lingering tax debt issues. Without the assistance of professional tax help specialists to guide them through an IRS debt collection process, individuals can become easily overwhelmed and find themselves worse off than before the process began. Providing the absolute best results in the tax debt resolution process requires a daily commitment to excellence and customer satisfaction. Ideal Tax Solution continually assesses its operational protocols in an ongoing effort to maintain its standing as a leader in the field of tax liability relief with a personal touch. The company prides itself on its record of positive resolution results while at the same time allowing its clients the opportunity to restart their lives outside the grind of the tax collection process. Tax resolution specialists interact with agents of the Internal Revenue Service everyday to negotiate settlements for their clients. The successful outcome of a tax debt resolution process depends on the expertise, professionalism and caring attention to detail that is conscientiously put forth by a tax liability specialist. The tax help team at Ideal Tax Solution prides itself on a track record of successful tax resolution second to none. There’s no need to suffer under the stifling stress of an IRS collection process. One call to the team of tax relief specialists at Ideal Tax Solution can turn your life around today. Professional tax debt resolution can save the life you’ve worked so hard to achieve!